The ongoing battle for hearts and minds in Iraq and Afghanistan is a military strategy inspired originally by efforts at domestic social control and counterinsurgency in the United States. Weaponizing Anthropology documents how anthropological knowledge and ethnographic methods are harnessed by military and intelligence agencies in post-9/11 America to placate hostile foreign populations. David H. Price outlines the ethical implications of appropriating this traditional academic discourse for use by embedded, militarized research teams. 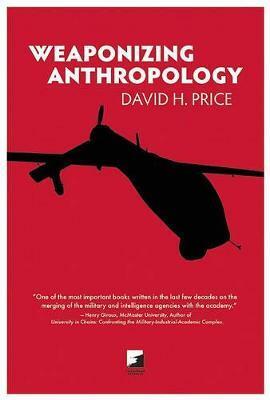 Price's inquiry into past relationships between anthropologists and the CIA, FBI, and Pentagon provides the historical base for this expose of the current abuses of anthropology by military and intelligence agencies. Weaponizing Anthropology explores the ways that recent shifts in funding sources for university students threaten academic freedom, as new secretive CIA-linked fellowship programs rapidly infiltrate American university campuses. Price examines the specific uses of anthropological knowledge in military doctrine that have appeared in a new generation of counterinsurgency manuals and paramilitary social science units like the Human Terrain Teams. David H. Price is the author of Threatening Anthropology: McCarthyism and the FBI's Surveillance of Activist Anthropologists and Anthropological Intelligence: The Deployment and Neglect of American Anthropology in the Second World War. He is a member of the Network of Concerned Anthropologists and teaches at St. Martin's College in Lacey, Washington.